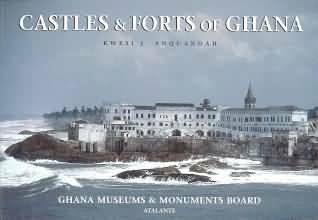 The cover picture is of Cape Coast Castle from the sea. Arhin, Kwame (ed.) The Cape Coast and Elmina Handbook: Past, present and future, Inst. of African Studies, University of Ghana, 1995. 20. . . for the greater part of their history the two towns (Elmina and Cape Coast) have grown in parallel alongside and very much aware of each other, keenly competing, not only in the fields of trade and political development, but in social, cultural and architectural fields as well. 21 . . . The traditional vernacular name of Cape Coast is Oguaa, from the Fanti Gua meaning 'market.' The traditions of origin of the indigenous inhabitants of the town assert that the Fetu state, of which Cape Coast, Oguaa, is the principal town, was founded by the Guan, probably during the thirteenth or fourteenth centuries. More recent immigration of Fanti from the Techiman area took place during the fifteenth to eighteenth centuries. 36 Nov 12 1770 12 slaves belonging to John Cabbess, principal caboceer at Komenda, some time ago barbarously murdered him. 8 of the ringleaders delivered to (CC?) castle to be secured until their trial by Cabbess's family. Members of his family including Cudjoe Cabboceer, linguist here, the linguist at Elmina, Kings of Abramboe and Agnafoe, etc. etc sentenced all 8 to death for unparalleled audacity and villainous behaviour. British prevailed on them to execute only 4. . . to deter other slaves from behaving in this cruel an atrocious manner. Jan 3, 1772 8 soldiers at CC castle afflicted with ulcers; will never recover in this country. Sent off the coast by any vessel who will carry them. Five pounds per head to be paid to the Master. Aug 11, 1772. Council held at Cape Coast Castle. There is the greatest reason to believe that the Ashantees intend to come down upon the Fantees and other inhabitants of the waterside in a hostile manner. Deputies from the Heads of the Fantees sent to ask the British what part we propose to take in case they are attacked by their enemies and to request our assistance in supplying them with gunpowder and guns. Fantees have always lived in friendship with us; we will grant them every assistance should the Ashantees attack them. The Fantees (a people long used to the manners of the Europeans and pretty much civilized) are as neighbours preferable to the Ashantees who are a rude unpolished set of men, governed by a despotic tyrannical prince. Chiefs of all forts to lay in a stock of corn and wood sufficient for 6 months and get their guns and military stores properly arranged and act with vigilance and circumspection. 92 The trade of the Royal African Company, which had commenced to decline with the passing of the Act of 1698, that declared the trade open, was now in a very wretched condition; the private traders, who had no establishments on the Coast to keep up, being able to sell their merchandise at a far cheaper rate than the Company could, while the payment of the ten per cent ad valorem for the maintenance of the forts was generally evaded. In 1721 the Company found it necessary to raise a large sum by subscription; the salaries of the officials were cut down, and Surgeon Atkins, of the Swallow who visited Cape Coast in that year, tells us that the Company's officers, with the exception of those of the first rank, were both wretchedly paid and badly used. They were liable to heavy fines for drunkenness, swearing, sleeping out of the Castle, neglect, and also for not going to church, and according to Atkins, these fines were so frequently inflicted that many of the subordinates found their whole pay swallowed up and themselves in debt to the Company, which in this way obtained a hold upon them, and prevented them from resigning their appointments. While he was there the captain of the Company's garrison at Cape Coast Castle escaped by night to a brigantine which was leaving the Coast; but the escape was discovered, the brigantine was chased and overtaken by the Weymouth, her master fined seventy ounces and flogged, and the captain restored to the tender mercies of the Company. A Mr. Phipps was Director-General of the English Company at this time. He built a circular tower on a hill about half a mile to the north of the Castle, which it commanded; it was named, after him, Phipps's Tower, but in after years became known as Fort William. In the decay of their prosperity the Company was now compelled to give credit to the natives, in order to compete with the private traders, who were unable to do this, as they only remained a short time on the Coast. Atkins says that, to secure the payment, the Company's officials used to make persons asking for credit pawn themselves to the Company, with the liability of being eventually sold in default. It was in consequence of the wretched condition of the affairs of the Company that on March 26th, 1730, the House of Commons resolved that the trade to Africa should be absolutely free, but that as it was necessary to keep up the forts on the Coast, Parliament should grant an allowance to the Company for that purpose. 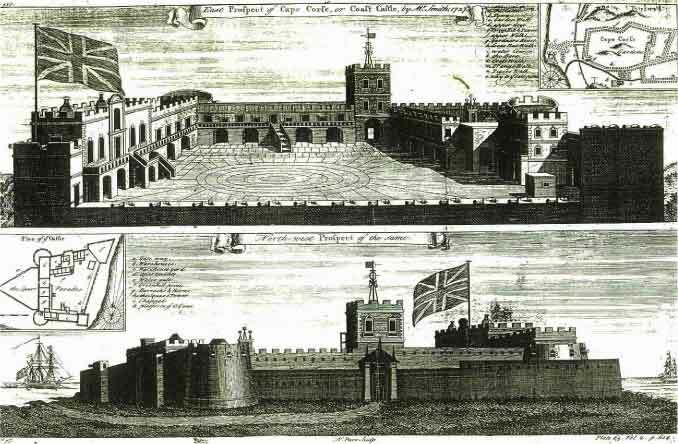 The trade had really been practically free since 1700, and all that this resolution effected was to transfer the cost of the maintenance of the forts to the English tax-payer, instead of making the private traders, who enjoyed their protection, contribute to their support; but it had been found impossible to collect the sums due from the latter under the old Act. In accordance with this resolution �10,000 was voted annually till 1744, when, on account of the war with France and Spain, the amount was doubled. In 1745 the grant again fell to �10,000, but in the year 1747 nothing was granted. Relieved of the cost of keeping up the forts, the Royal African Company contrived to prolong its existence till 1750, when an Act, entitled �An Act for extending and improving the trade to Africa,� was passed, and a fifth company, called the African Company of Merchants, was formed. The slave trade had now increased to such an extent that the Gold Coast alone was said to furnish annually ten thousand slaves for the West Indies. This impulse was chiefly due to the success which had attended the arms of Ashanti, and thousands of prisoners of war were sent by that people to the great slave mart of Manso for sale to the native brokers. The Gold Coast negroes were termed Koromantees, or Koromantyns, in the jargon of the slave traders, this name being a corruption of Coromantine, whence the English had first exported slaves. They were distinguished from all other slaves by their courage, firmness and impatience of control; characteristics which caused numerous mutinies on board the slavers, and several rebellions in the West Indies. In fact every rebellion of slaves in Jamaica originated with, and was generally confined to, the Koromantees; and their independence of character became so generally recognised that at one time the Legislature of Jamaica proposed that a bill should be brought in for laying an additional duty upon the �Fantin, Akin, and Ashanti negroes and all others, commonly called Koromantees,� that should be imported. The superior physique of the Gold Coast negroes, however, rendered them very valuable as labourers, and this bill met with so much opposition that it was withdrawn; and, notwithstanding their dangerous character, large numbers continued to be introduced to the island. Bryan Edwards says: �Even the children brought from the Gold Coast manifest an evident superiority, both in hardiness of frame and vigour of mind, over all the young people of the same age that are imported from other parts of Africa. The like firmness and intrepidity which are distinguishable in adults of this nation, are visible in their boys at an age which might be thought too tender to receive any lasting impression, either from precept or example. I have been myself an eye-witness to the truth of this remark, in the circumstance I am about to relate. A gentleman of my acquaintance, who had purchased at the same time ten Koromantyn and the like numbers of Ibos (the eldest of the whole apparently not more than thirteen years of age) caused them all to be collected and brought before him in my presence, to be marked on the breast. This operation is performed by heating a small silver brand, composed of one or two letters, in the flame of spirits of wine and applying it to the skin which is previously anointed with sweet oil. The application is instantaneous and the pain momentary. Nevertheless, it may easily be supposed that the apparatus must have a frightful appearance to a child. Accordingly, when the first boy, who happened to be one of the Ibos, and the stoutest of the whole, was led forward to receive the mark, he screamed dreadfully, while his companions of the same nation manifested strong symptoms of sympathetic terror. The gentleman stopped his hand; but the Koromantyn boys, laughing aloud, and immediately coming forward of their own accord, offered their bosoms undauntedly to the brand, and receiving its impression without flinching in the least, snapped their fingers in exultation over the poor Ibos. From the testimony of Phillips (1693) we find that Gold Coast slaves would always yield in the West Indies �3 or �4 a head more than these of Whydah, who were generally called Pope, or Pawpaw, negroes. These latter again were preferred to the Ibos, and the Awuna slaves were considered the worst of all. Snelgrave, who made voyages to the Gold Coast in 1721 and 1722, confirms this, and says that the Koromantees were the most dangerous slaves to deal, with. He gives particulars of two mutinies of slaves on board slave-ships, one at Anomabu which were planned and carried out by Koromantees; and remarks that such slaves were �desperate fellows who despised punishment, and even death itself.� Some mutineers, when asked why they had mutinied, boldly told him that he was a great scoundrel to have bought them for the purpose of taking them away from their native country, and that they were resolved to obtain their liberty if they could. The large majority of the slaves exported from the Gold Coast were prisoners of war, of both sexes, and of all ages; the residue being persons who were slaves in their own country, and those who under the customs of the country had become liable to enslavement for debt or crime. Many young men, it is said, were entrapped by the wives of men of rank, who, instructed by their husbands, formed intrigues with them and then denounced them. By native law such an offence could only be expiated by the payment of a sum proportionate to the rank of the injured husband, with the alternative of slavery; and as the youths entrapped were commonly such as could not pay, numbers thus became enslaved and were sold out of the country. The slaves, before being brought to market by their native owners, were close-shaven and anointed with palm oil, so as to give the skin a glossy appearance, and it was no easy matter to distinguish a young from a middle-aged slave, except by the decay of the teeth. Various artifices were resorted to by native slave dealers to give an appearance of youth and health to slaves of an inferior quality, and there was as much chicanery brought into play over the sale and purchase of slaves as there is at the present day in horse-dealing. Hence, all slaves bought for exportation were carefully examined by a surgeon, to see if they were sound in wind and limb, and were put through various performances. Such as passed the surgeon's examination were then branded on the breast or shoulder; the men were coupled together with irons, and all were consigned to the dungeons or slave-rooms of the various forts, till such time as a ship arrived to convey them to the West Indies. The slaves so dreaded leaving their native country for an unknown fate in a strange land, that they often, unless most carefully watched and secured, leaped overboard from the canoe or ship, and kept under water till they were drowned; while others starved themselves to death. Death had for them no terrors; there was no uncertain future to be faced. There was simply a more or less prolonged struggle and then a change of residence to a spirit world, similar in all respects to this, where they would continue the old life amongst their own people; and it is not surprising that they should prefer this to a life of unknown, and consequently dreaded, terrors in another sphere. The natives of the Gold Coast were so confident that after death they would rejoin their own people in their own spirit world that during the suppression of every rebellion of slaves in Jamaica, numbers of Koromantees committed suicide; and dozens were sometimes found hanging to the branches of the silk-cotton trees. By some tribe, it was held that dismemberment prevented this return and it appears that the masters of some slave vessels, who had reason to anticipate wholesale suicide, did not hesitate to cut off the arms or legs of one or two slaves to terrify the rest. On board the slave ships, slaves were fed twice a day, and allowed in fair weather to be on deck from seven in the morning till sunset. The women and children were allowed to go about free; but the men were usually kept in irons at all events till some days after the African coast had been left, and were invariably separated from the women. Every Monday they were allowed the luxury of pipes and tobacco. Although there were, no doubt, individual cases of cruelty here and there, yet, on the whole it seems that this monstrous traffic was carried on with as much humanity as the circumstances and the system allowed. The traders had a pecuniary interest in the well-being of each human chattel, and therefore they did not ill-treat them, or so act as to cause their value to be lessened. The slave ships were usually roomy and well found, and at this time, while the trade was lawful, not half the hardships were experienced that afterwards fell to the lot of slaves exported when the trade was declared to be illicit. Any account of the Gold Coast at this time would be incomplete without some reference to the pirates who infested the whole West Coast of Africa. The breaking up of the haunts of the buccaneers in the West Indies had led those gentry to adopt a change of scene, and their vessels, two or three of which usually sailed in company, roamed up and down the whole African coast, and committed the greatest depredations. Some of the pirates made a business of waylaying slave ships, transferring the human cargoes to their own vessels, and selling them in the West Indies; while others plundered and burned every peaceable merchantman they met. They were sufficiently formidable to capture some of the Royal African Company's forts. For instance, James Fort, in the River Gambia, was taken by Davis, the pirate, in 1719, and Bunce Island Fort, Sierra Leone, by Roberts, in 1720; and, as already mentioned, the two Danish men-of-war, each of 26 guns, sent out to recover Christiansborg from the natives, were taken by Avery in 1693. In one year, Roberts destroyed over a hundred sail of ships along the coast, and at last commerce became so crippled that the English Government, in 1721, sent out the Swallow and Weymouth men-of-war, to put an end to these depredations. The Swallow fell in with Roberts, with three pirate vessels, at Cape Lopez. In the action which ensued Roberts was killed, and the pirates, some three hundred in number, nearly all Englishmen, surrendered after a very feeble resistance. The prisoners were conveyed for trial to Cape Coast Castle, where fifty-two of them were executed; and when Smith, surveyor of the Royal African Company, visited Cape Coast in 1727, the remains of several of these were still hanging in chains.
. . . Proceeding seven miles further in an easterly direction is Cape Coast Castle, the British head-quarters, which is a large and commodious building, containing comfortable apartments for the officers, and good barracks for the privates, besides many excellent warehouses, where the property of our merchants is lodged in the event of war with the natives; and even in time of peace, one or two of the warehouses are made use of for this purpose. There are also excellent tanks for the supply of water in the dry season, or when blockaded and great credit is due to the present chief governor for the improvements he has made . . .
Will not every British planter in America and West India Merchant in England grant, that the Negroe trade on the coast of Africa in the chief and fundamental support of the British Colonies and Plantations in America? Should our most formidable rivals monopolize the African trade to themselves, will they not naturally furnish their own colonies with the best of the Negroes and suffer Englishmen to purchase their Refuse only and that too at an exorbitant rate? Our neighbours Nations wisely consider their African trade in the light of a nursery to their colonies and plantations in America and as such they studiously cherish and preserve its . . .
5 Is it not evident that here is not a man in this Kingdom, who, in proportion to his rank, the Community does not more or less partake of the Benefits of the African Company's Forts and Castle in Africa? 6 Before the RAC had built a sufficient number of forts and castle on the Gold Coast, the Dutch interrupted our Trade and seized and confiscated our ships on that coast. 19 Exports to West Africa: long list including: copper and brass of all sorts, blankets, bells, amber beads, crystal and coral beads, broad cloth, carpets, cotton stuff of many sorts, worsted damasks, fringe, flints, fire steels, muskets, carbines, blunderbusses, fowling pieces, pistols, gunpowder. Imports from the East Indies: Bombay stuffs, calicoes, ginghams, guinea cloths, sattins, seersuckers, taffaties, silks, fine hats, felt hats, handkerchiefs, iron bars, wrought iron, knives, lead bars, lead shot, liquors (brandy, beer, rum, wine) looking glasses, medicines, paper, padlocks, pewter, provisions (beef, bread, butter, cheese, flour, pork, suet, vinegar) German Scotch and Irish linen, cutlasses, swords, buttons, gold and silver thread, coats, waistcoats, breeches, drawers, shirts, shoes, slippers, stockings . . .
Exports: gold, beeswax, elephants teeth, gums of all sorts, cotton wool, divers dying woods and Negroes and Laybourers for the Plantations, etc. 24 On average it costs about �17000 p.a. to maintain all RAC forts and castles in Africa. Magazines, warehouses, storehouses, granaries, guardrooms, tanks or cisterns built with brick or tarras holding about 2000 tons, repositories to lodge about one thousand Negroes and vaults for rum, workhouses for smiths, armourers, coopers, and carpenters, 57 great guns, small arms, blunderbusses, buccaneer guns, pistols, cartouche boxes, swords, cutlasses. Ammunitions for great guns and small arms, stores and tools for brick makers, bricklayers, armourers, gunners and gardeners, small vessels, pinnaces, cannoes and men answerable attending on the Castle and Garrison and for fetching and carrying materials for buildings and stores to and from the outforts. Ponds and canals for fresh water, gardens of a large extent, producing all necessaries for the Castle and Shipping as plaintaines, bananoes, pine apples, apples, potatoes, yams, corn, colworts, peas, beans, cabbages and all other European refreshments. Lawrence, A. W. Trade Castles and Forts of West Africa, Jonathan Cape, London, 1963 (quotations and notes) See also Lawrence, A. W. Fortified Trade Posts: The English in West Africa 1645-1822, Jonathan Cape, London, 1968 (recast in a shortened form and retitled) Copyright material is used here with the permission of the owners, the Trustees of the Seven Pillars of Wisdom Trust. 29 European salad plants, cabbages and cauliflowers from imported seed, fruit trees from tropical Asia and America. Newly introduced: lemon, sugar cane, melons, orange, tamarind, banana, coconut, pineapple, pawpaw, guava. (mango - origin in Indo-Burmese region- and avocado - native of Central America - were then evidently unknown) sweet potato, yam, maize (?) cassava. 49 Senior and junior officer, free artisans, soldiers, slaves for indoor and outdoor work. Paid (sometimes live-in) free Africans or mulattoes. If necessary Governor might even get supplies from a foreign fort in the neighbourhood. In 1778 Cape Coast borrowed cartridge paper from Elmina. In 1780 Elmina sold 55 fathoms of new 5" cable, weight 274 lbs. at 1 oz of gold per 100 lbs. for a schooner of the English company. Loneliness: mutual business (between forts) usually arranged by letter. Only Members of Council or Company's seamen made regular journeys. Officers jumped at the chance of going visiting, several hours by canoe or in a hammock carried by 1 or 2 couples of men. Different companies entertained one another, relations superficially amicable; business rivalry, spies, plots. 1779 the indefatigable pains and perseverance, peculiar to the Dutch, with which they by degrees endeavour in future to bring about their beloved and political but diabolical plan to force the English town of Komenda into uniting with their own protectorate across the river. Tedium, strains, isolation, conditions of physical and mental distress, grumbling, bad temper. Open dissensions and quarreling at the Governor's table. Maudlin and assertive recollections of elderly governor. Senior officers might arrange for Africans to drum and dance in the garden for their entertainment. Main feature of conviviality was drinking. English mixed their brandy with lime juice, sugar and water. Drank to excess. English allowed men to spend the night in the town and to bring women into the fort. Slaves brought firewood - large amounts required. Arrival of ships interrupted everyones routine. When the fort's lookout sighted approaching sails, the flag was hoisted and preparations made to receive the vessel. Canon made ready (is it a pirate?) Friendly man-o-war or ship with VIP entitled to a salute of so many guns. Cargo brought ashore by canoes or small boats belonging to the fort. Canoemen organized by a bumboy, free African employed by the fort. Transport of goods from the beach to storerooms done by slaves on their heads. Clerical staff hard worked, inventory of incomings, calculating prices. Ships master in a hurry - scared of disease affecting his crew. Medical precautions. Men not to drink palmwine. Unsuitable living quarters, poor diet, habitual drunkenness, savage punishments. Malaria, yellow fever, waterborne diseases. 302 From Cape Palmas we had little more than the current to help us. However, this slow progress enabled us to see the situations of Apollonia, Dix Cove, Succondee, and Commenda, all English forts and factories; and, passing the picturesque castle of Elmina, we cast anchor in the roads before Cape Coast. I did not go on shore till the next day, and had ample time to contemplate the lovely appearance this place presents, when viewed from the sea. The castle, which is a large white stone building, and surrounded by curtains, bastions &c., is partly erected on a rock; called the Tarbara. The native houses, interspersed with the more tasteful dwellings of the European merchants, lie to the right; and everywhere the hills rise from the water's edge, covered with the richest and most luxuriant forest. Further down the coast, and about four miles distant, the ruins of the Spanish fort of Moree crown one of these hills; and a glimpse of the English Annamaboo greatly increases the beauty of the landscape. Plate 5 The barque Guiana 256 tons built in Sunderland 1831: 3 masts, long and low. 3 1780-1790 period of great activity for the slave trade. c64,000 slaves being carried across the Atlantic each year. British share c38,000. By 1785 Gold Coast was exporting about 10,000 slaves per year. Trade in commodities was beginning - mainly palm oil (used in Europe principally to make soap) also ivory, gold, hides, beeswax, timber. 6 Palm fruit harvested throughout the year mainly March to May. Fruit grows in a bunch each with several hundred fruits. Nut, kernel (commercial palm kernel) pericarp (flesh eaten, source of palm oil). Palm kernel oil not known in 18c. Palm oil red liquid, traditionally used as food, as an illuminant, and for making soap in combination with ash. Oil palm tree reaches up to 40ft. Village boys climb trees using locally made ropes around tree and body 'to give a purchase'. Cutter climbs palm, cuts ripe fruit bunches, collects them, takes them home. Fruit detached, placed in cauldron and boiled with water. Women's work, steamed fruit placed in wooden mortar and pounded with a wooden pestle. Fruit reduced to a pulp containing fruit fibre (with oil) and nuts. Nuts separated by hand (women and children) Fruit fibre placed in a rope net, twisted using a stick for leverage, wrings oil out of the fibre. Sometimes fruit mass is placed in a canoe and treaded - oil flows to the lower end. Palm oil supplied in calabashes. Forest zone infested by tsetse fly which caused sleeping sickness. 13 There must have been a tremendous slaughter of small elephants. Fresh fruit and provisions available. Trade in blue baft (woven cloth with indigo dye) muskets, powder, leaf tobacco, pipes, rum, second hand clothing, trinkets incl. beads. Recruits graded as writers, promoted to factors. Death rate amongst Europeans was fantastic. 32 The main factor would accumulate slaves and other African goods to await the incoming ships. Life in the forts was generally very difficult. Quite apart from discomfort and disease and the inevitable deaths commercial life on the coast was a permanent worry. Forts needed frequent and great repairs. Humidity, torrential rains, fierce heat, corroded the buildings. In those steamy quarters merchants, soldiers and tradesmen lived out their unpleasant and often all too brief existence in Africa. Monotonous procession of corpses to the local burying ground. 33 Grace, functionalism, power of Elmina. . . . defences against Africans and other Europeans, their big guns trained seaward against the possibility of attack by enemy ships. They were trading posts, with a host of offices, storage rooms and negotiating forums. They provided a home for a procession of white men and for many more Africans. The keeping of slaves underground is a good security against any insurrection. 34 Massive airless cellar. Slave Hole at Komenda 1756. In some forts light and air filtered into the slaves' prisons from grilles set in the overhead walkways. The enslaved Africans could see free people walking above them, as they were to see the crews of slave ships pacing the decks above them. 35 Slave ships offered storage space for slowly accumulating cargo. Africans arrived in coffles i.e. tied by the neck with leather thongs, at about a yard distance from each other, thirty or forty in a string. Arrived with a bundle of corn or elephants teeth upon each of their heads. Slave trading on the coast developed its own conventions, rituals and etiquette, all of which had to be observed. Gifts were offered and accepted, drinks and smokes exchanged, food cooked and consumed together. 36 Slave traders did not want sick or diseased Africans. Experience was important in spotting sick slaves. Worst of all were contagious slaves, for their ailments could cause devastation in the squalid confines of the ships.. Examined slaves as butchers examine beasts at European slaughter houses. Countenance, stature, good set of teeth, pliancy in the limbs and joints, free of venereal taints. If they were afflicted with any infirmity or are deformed or had bad eyes or teeth, if they are lame or weak in the joints or distorted in the back or of slender make or narrow in the chest in short if they have been or are afflicted in any manner so as to render them incapable of much labour. If any of the foregoing defects are discovered, they are rejected. Rejected slaves often had to bear the anger of the thwarted slaver. Anstey, Roger. The Atlantic slave trade and British abolition, 1760-1810. Atlantic Highlands, N.J.: Humanities Press, 1975. Anstey, Roger. Liverpool, the African slave trade, and abolition: essays to illustrate current knowledge and research. Historic Society of Lancashire and Cheshire. Occasional series, 2. Enl. ed. [Liverpool]: Historic Society of Lancashire and Cheshire, 1989. Bean, Richard Nelson. The British trans-Atlantic slave trade, 1650-1775. Dissertations in American economic history. New York: Arno Press, 1975, c1971. Brooks, George E, The letter book of Capt Edward Harrington, Tr. Hist Soc of Ghana, Vol. ?? Craton, Michael. Sinews of empire; a short history of British slavery. [1st ed.]. Garden City, N.Y., Anchor Press, 1974. Lewis, Roy and Yvonne Foy, The British in Africa, London 1971. Palmer, Colin A.. Human cargoes: the British slave trade to Spanish America, 1700-1739. Blacks in the New World. Urbana: University of Illinois Press, c1981. Walvin, James. Slaves and slavery: the British colonial experience. Manchester [England]; New York: Manchester University Press; New York: Distributed exclusively in the USA and Canada by St. Martin's Press, c1992. Walvin, James. England, slaves, and freedom, 1776-1838. Jackson: University Press of Mississippi, 1986. Media Collection (database of images in .jpg and .mov format), Panoramic Images (.mov) and the beginnings of an Architectural Inventory. From The University of Virginia and US/ICOMOS. Collection of photographs. From The University of Virginia. Paper about sensitive and sustainable site development in Cape Coast to help the local economy through tourism. Photographs plus hightech imagery. From the US/ICOMOS Cultural Site Analysis Initiative.